No fees are charged on guests registration nor for extra users. Pros: It is very, very intuitive. As soon as you can think about a feature, it's actually on the next line. It literally thinks the way you think as an event organiser. Cons: I'd have to do very deep and long thinking to be able to mention even one. Overall: Hard to do better. We are a convinced customer for our future events and will advise others enthousiastically to choose for Idloom too. Thank you for your review Brecht! We're glad to read that our software helped you with your events and was easy to use. We very, very much appreciate your comments on the tool. Having a customer giving us this kind of review truly makes our entire team happy and proud to be working so hard to deliver quality products and support to our clients ! We're very grateful to have you as a client, and hope you'll continue using our solution for your next events ! If you have any recommendations for further improvements, don't hesitate to reach out ! Thank you and good luck with your future events ! Pros: As we organise a series of different events throughout the year we needed an event management tool that would be able to accomodate the needs of basic and complex events (multi-day, multi-location, multi-workshop, ...). Cons: Using idLoom is very intuitive that might explain why there's no real help section. Even though we always get the answers we need a dedicated help page would be nice. 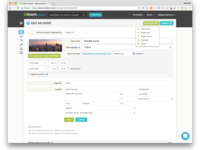 Overall: Event creation, registrations and check-in have never been so easy. Thank you for your kind review Michèle ! I'm glad to read our software is useful for managing your events, and that the custom features we developed for you are helpful. Thank you as well for the feedback on the help section. We have since then been very active in creating a well-documented user guide, with all new releases and their corresponding user manuals. Furthermore, we try to ensure that all new development is made in an easy to understand manner, so that users find their marks in a few seconds only in the software. If we receive a complaint or a question on how things work, we make the necessary amendments to make sure things are more intuitive. Good luck with your future events! Pros: Very userfriendly, professional platform. We used it for a customer event and were able to set up a great looking registration page. Managing guests was very easy. Cons: The only small thing was that we allowed people to bring a guest and these guests weren't in the counts. Dear Robrecht, thank you very much for this review. Indeed the accompanying person feature you used is informative only, and doesn't count as a registration. It was actually developed so that guests could inform that they'll come accompanied to part of the event (dinner for example, so the organiser can adapt catering needs appropriately), but it is not an actual registration. If you need to have this person count as a participant, you need to register him/her separately. However, we're about to launch a new multi-ticket function, that will allow you to purchase multiple tickets at once. This might be a solution for you, although it won't be nominative. I hope this helps. If these solutions don't suit you, you know that we can always develop custom features for you, if desired. Thank you for your review! We're glad to read that our software helped you with your events and was easy to use. We work hard every day to provide the most advanced set of features available on the market today, all packaged in an easy and fun to use product! In fact, we've added quite a few features to customize your events even more, including picture galleries to websites. It might be useful for you to try one of our higher subscription plans, as they are directly targetted towards events professionals, with unlimited customization options! We'd gladly give you a free trial of any version! Thank you very much for your kind review! We're happy to read that you like our tool. As for the different logos per event, this feature is available with our Corporate plan, where you can edit multiple event profiles within a single account. Don't hesitate to get in touch if you need more information. 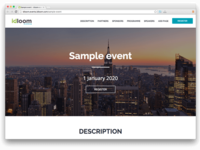 Pros: It allows for customisation of the event website with the requisite event information and branding while also providing a great deal of functionality. It was also simple to link it to the organisation's website.Customer support team did an excellent job in responding to these requests which enhanced the overall experience. Cons: Given that the software had a more Euro-centric focus, a few amendments needed to be made in order to meet our organisation's requirements as a Caribbean entity. There were some constraints surrounding the amendment of invoices and badges based on existing organisational standards. However, it worked well if the basic information was needed. Overall: Reduction in time spent on pre-event activities. The automatic generation of invoices. Don't hesitate to reach out if anything should still need to be adapted! Dear An, thank you very much for your review! We're glad to read that the tool was useful to you ! Regarding the limitation of subscriptions for workshops, this is actually something that you can easily do. You can limit the total number of available places, specific quantities of available places for each sub-session/workshop, or both simultaneously (maximum for the entire event, with a specific split of quantities per session/workshop)! Next time, don't hesitate to reach out to us via our chat, by email or call us directly. We'll be happy to help you set it up ! Pros: Easy to work for users and administrators. Good look. Lot of options and we can create event taylor made! Cons: Nothing special... I like all of it! Overall: We earn time and effectivity! Comments: I'm so glad that I found IDLoom. The platform is ideal for my company's conference business, easy to use, and the guys are super-responsive and go out of their way to help with even the smallest query very promptly. Pros: The software takes your event to a next level. The package is complete and is really easy in use. Even with a free version you can make the organising of events easier. It's basicly self-explanatory and in doubt, the customer service is excellent and extremely fast. Cons: Off course a platform like this comes with a price, although it is worth it. Overall: We know now who is actually attending the event. In the past we worked with different types of registration, but this combines it all, plus it works with the GDPR rules. Easy check-in to go for a better follow up. Thank you for your review Tine! We're glad to read that our software helped you with your events and was easy to use. Thank you for the review Lauriane! 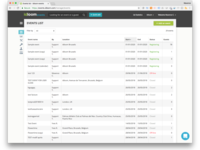 If you ever have users experiencing difficulties with the tool, don't hesitate to send them directly to our customer support. We'll help them out, step by step. Pros: It is easy to use and I believe it is value for money. Cons: It takes a bit of a long time to load, and it's sometimes slow. Overall: It is the value for money. vey helpful. Thank you very much for your review. We're glad to read that you liked the tool. I'm surprised you found it slow at times, it might have been a connection problem. If you encounter any more such issues, don't hesitate to get in touch with us, we'll gladly help you troubleshoot the issue. Looking forward to have you back! Also, we offer a 50% discount for education, in case you're interested. Good luck with your future events ! Cons: It lacks a testing environment. On the other hand, everything works. Overall: Idloom provided me with the system I needed at a very friendly price. The greater part of working with the system is intuitive and therefor really easy. At some parts you think: this is to simple to work out good. But it does, everytime. The one time I made a mistake one phonecall was enough to get me on the go again. Thank you for your kind review! Looking forward to working with you again. Made our registrations process easier! 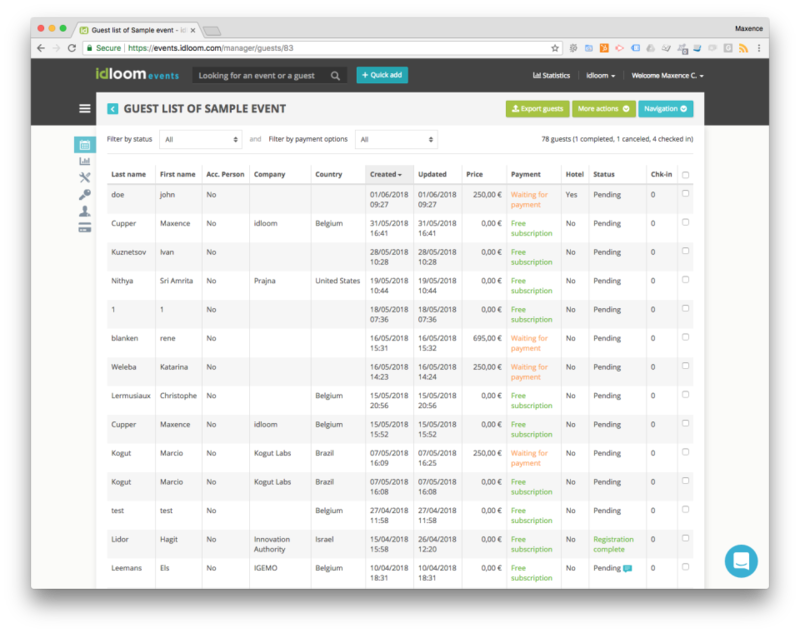 Comments: Quick, fast and efficient - IDLoom worked for our event management unexpectedly well. A flat learning curve, fantastic customer service, flexible pricing and most of all - a platform that worked from the word "Go!". The best part of it is that the team is taking feedback and acting on it almost immediately. This means that the platform will evolve organically and therefore will offer real-world solutions. 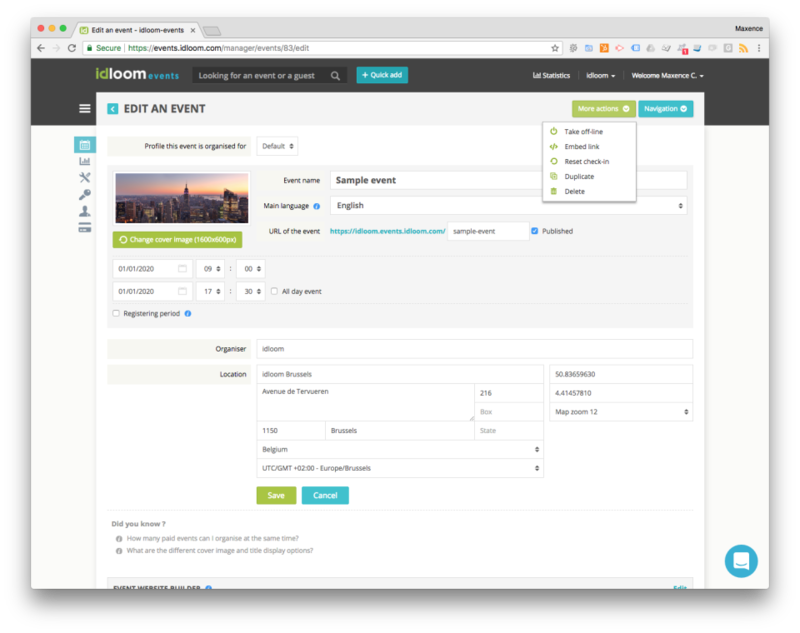 IDLoom has also saved me costs of developing a separate website for my event - the public interface it provides works better than any event website I've seen with many customisation options. I am extremely pleased with it so far! Our goal is your success. Thank you for this review. Great tool with lots of functionalities. Also support by mail and phone is very punctual and handy! Pros: Software does what it's promising. The tool includes all needed features to make event registration as easy as possible. Cons: Nothing, all works fine for us. With help of the great customer service, we were also able to adapt the colour scheme to the one of our brand! Thank you for the review Willem. We try to give our users the best possible customer service out there. It's great to read that you enjoyed it! Dear Britta, thank you very much for your comprehensive review. We're happy to read what our customers thought of the service, and how to continuously improve our platform. Indeed some more advanced features are only available with the Premium version and above. What I suggest is that we discuss the features needed for your future events together, so that we can find the best solution for your specific needs. Great improvements have been done. Very useful and complete event tool! Thank you for your feed-back. We'll definitely improve that part and the invoice payment management in the next release to be published in May 2016 ! 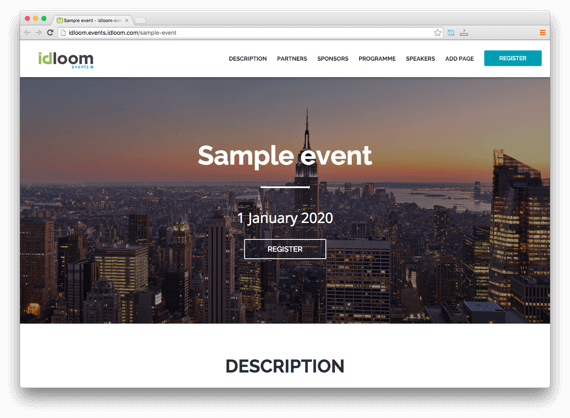 Pros: I loved how easy it was to create a website for our seminar - and registrants reported that it was very easy to register. Cons: I would have liked to be able to send emails to registrants. Overall: When we had questions or needed help, they were very responsive. Thank you for your review Laurie! We're glad to read that our software helped you with your events and was easy to use. Pros: It was very easy to use and set up to begin receiving payments from attendees. Cons: No issues with the software. It worked perfectly and we had no complaints. 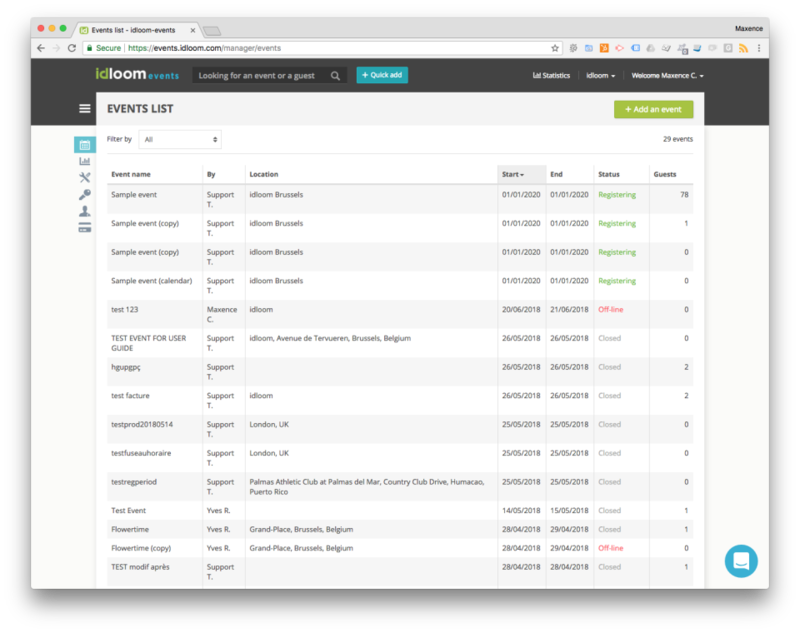 Overall: Idloom-events gave us a simple and streamlined solution for advertising our event online and receiving payments from non-subscribers who are interested in our events. It was exactly the solution we needed as a small business. Thank you for your review Brendan! We're glad to read that our software helped you with your events and was easy to use. This site met my needs well, and excellent customer support. Pros: This is a very professional looking website, with a good range of functionality. 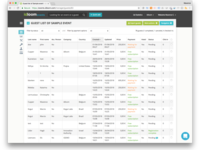 Once set up invoices spread sheets and other useful features were instantly updated. Cons: As a medical professional I found the technical aspects of setting up the site and receiving payment not particularly intuitive, however, it didn't take me too long with a bit of customer support. Thank you very much for your kind review. Rest assured we continuously work hard to make it ever more user-friendly and intuitive to use. If you have any questions, don't hesitate to contact our customer support 24/7. Pros: Easy to use, friendly and supporting staff and customer support. Overall: We had a very good experience with this service provider, which beside offering this platform as advertised, it also customized it for our needs. Dear Mr Manolescu, thank you very much for your kind review! Creating a customised booking website. Pros: Awesome support and reactivity of the Idloom Team for the customisation of the website! They really did a great job and we certainly will continue to use it in the future!!! Cons: Must be in contact with the Idloom Team to tweek and customised the basic platform. We can't tweek every parts of the platform. Dear Julien, thank you very much for your comment. We're happy to read that you were happy with the tool and service, and we'll make sure to further develop new layout customising options in the future. Overall: Simplification and modernization of our registration system. Dear Mrs Vranken, first of all thank you for your kind review! What did you mean with the 100 word survey, are you referring to Capterra or idloom?